British band Klaxons have been awarded the Best Art Vinyl prize for the astronaut cat cover of their second album, Surfing The Void. The band beat out 49 other contenders for the honor, which was determined by a public vote. Awards director Andrew Heeps told BBC News, "The Art Vinyl award is about celebrating the emotional resonance of the best sleeve designs from 2010." "After a boozy night out with myself, Richard Robinson, Jamie Reynolds and new live band member Anthony Rossamondo we ended up back at Anthony’s flat where our attention focused on firstly a fictional record for Richard and then on the new Klaxons sleeve. Before long we were looking at random pictures of cats in spacesuits and laughed at how striking a massive billboard would look, and that was the beginning! We soon set about making it a reality, the label hired a real space suit from the US, Richard designed flags and badges to complete the picture. All that was left was to get Jamie’s cat in the spotlight and hope he was up to the task…. We couldn’t have asked for more, he was a true pro and we sent the backup cats home!" 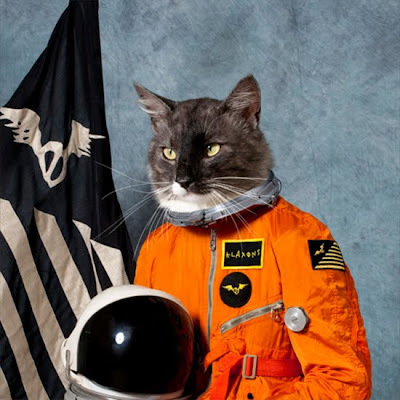 Back when the album cover was released in June, Best Week Ever put together a definitive list of "Catstonauts" to celebrate. This picture is great, I'm so glad it won!! !